Many homeowners become uncomfortable at the idea of the do-it-yourself upkeep of their homes. Clean air should be the number one concern of every homeowner. Changing the air filter in your HVAC system is one way to guarantee good clean air is circulating throughout your home and it shouldn’t be assumed that this is a task that is be too complicated for them do by themselves without previous or professional experience. Changing the air filter in their HVAC system is not a complicated task and it falls well within the do-it-yourself category. Filters are normally located at the central air return register, at an attic or basement air handler or next to an electrostatic air handler. Look for a 1″ slot that allows for the insertion of a filter. Once located, it is essential to check your air filter’s condition every month to 45 days to insure it is clean enough to keep the air quality in your home at an acceptable level of cleanliness, plus keeping it clean insures that the HVAC system will be able to maintain a comfortable temperature in your home without having to overtax itself, which could lead to the system working poorly or breaking down. Upon examining the filter, if it is dirty or clogged, it is time to change it or if it is a washable filter, clean it. Until is washed or replaced, it will cause the HVAC system to perform sluggishly and eventually stop working completely. The filter’s job is to trap dust, dander, debris and sometimes pollen, pollutants, allergens, mold and mildew as well. Your dirty filter may be clogged with any number of these elements, each contributing to creating a boundary between your family and clean air. The cleanliness of the air you want for your family will be determined by the type of filter you choose for your HVAC system. You have your choice of a panel often made of fiberglass. It keeps out dust and debris and pet hair, which may clog up the filter faster. An electrostatic filter magnetically traps particles by charging the particles with static through the first layer and then trapping them when they go through subsequent layers. 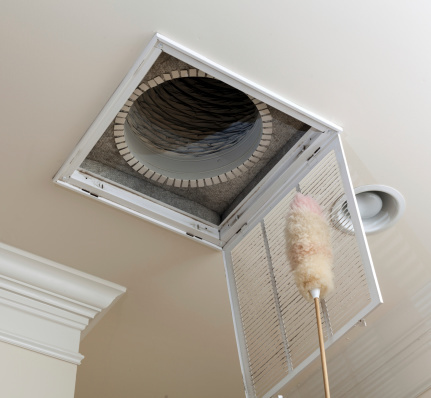 You could select a pleated filter, which has more layers to traps particles in or a HEPA filter, which traps 99.7% of pollutants including dust, mold, allergens and pollutants. You could also select a washable filter that has a longer life, but it limited to stopping only a limited number of pollutants or you could choose a HEPA washable filter which would be good for the environment and provide excellent air quality for your family. Your choice of filter and the frequency with which you change it will determine the air quality in your home. It will also affect the performance of your HVAC system. As a homeowner, it is your job to maintain your HVAC system by changing the filter regularly and hiring a professional for more complicated upkeep.